Have you heard of these names : Star Haven, Air Hostess, Half A Crown, Red Satin, Own Opinion, Exhilaration, Oxford Blue, Star Contender, Star Performer, Smart Chieftan, Southern Empire, Mystical….. famous race horses, of course.. Race horses are carefully bred. In India, in the mid 80s the name that ranted the horse races were that of siblings - Chaitanya Ratham and Chaitanya Chakram. Their dam was Urvashi. Chaitanya Ratham was a filly who won 12 races ; Chakram was a colt which eclipsed the exploits of his sister winning 15. Other than my self-professed love for elephants, the horse that used to go in front in the Temple procession at Thiruvallikkeni was also a hit... this year Brahmothsavam – there were two of them... and I had posted on that too … horse is one of two extant subspecies of Equus ferus. Humans domesticated horses and needed them to perform a variety of duties. There is an extensive, specialized vocabulary used to describe equine-related concepts, covering everything from anatomy to life stages, size, colors,markings, breeds, locomotion, and behavior. Historically, one tend to associate great horses to Arabia but factually majority of the founding mothers of prized horses come from Europe. These race horses look very majestic and shining. Pesi Shroff (incidentally born in 1965), Vasant Shinde, Aslam Kader, Robin Corner, Malesh Narredu and Appu are some of the famous champion jockeys. Derby is the place for horse racing and for long I thought the association is with Derbyshire – a county in England which our Srinivasan Venkatraghavan represented in 1970s. Far off the target. Understand that Derby is a type of horse race named after Derby Stakes which runs at Epson Downs Racecourse. It is Britain’s richest race and most prestigious of the classics. This place actually is in Surrey, England. For those totally new to punting, horse racing is a equestrian sport generating billions of money. In Chennai, Guindy is the famous place associated with horse racing…. Race horses are costly – their owners spend handsomely for their upkeep and maintenance – they are transported in air-conditioned coaches, provided rich food, have good Veterinary care and handled with lot of care ….all their needs are minutely taken care of by a team which attends to it regularly ……. A royal life one tends to think !! Nearer Thiruvalluvar statue (opp to Madras University Oriental research facility) saw a horse lying down on the platform, writhing in pain – could not make whether it had been hit by a passing vehicle, but was in visible pain – could not stand up … there were a group of people, most noticeably a young bearded boy (later identified as Satish) – a couple of police stood guard through the few hours of ordeal … a group of youngsters stood anxiously around, trying to do whatever they thought fit (none qualified to handle an injured horse though!) – the good Samaritans provided fodder (grass), cleaned and offered a bucket of water, telephoned bluecross and anxiously waited for the bluecross to come. It took some time – seemed long - by the time, the horse could muster some strength, tried to stand and fell a couple of times, later slowly stood up … and by the time the ambulance arrived. The man at the wheels seemed well-informed – the horse by this time got up and those around could guide it towards the van – the hydraulic platform was lowered – a bunch of people (again with no previous experience) stood nearer slowly pushing it on to the platform – it was raised slowly – to the level of the truck, horse gently guided by a small boy who had come in the bluecross van – tethered to the corner, much to the relief of those good Samaritans and other passerby & just about time it was to be transported, a young boy came claiming that it was his horse … it was left uncared for hours and easily could have met its end ………. Today, the same incident has been reported in Times of India, Chennai edition too. The horse is reported to be of top pedigree ‘General’ by name. The pedigree horse in its heyday was no doubt a source of great pride, fame and money for its owner. 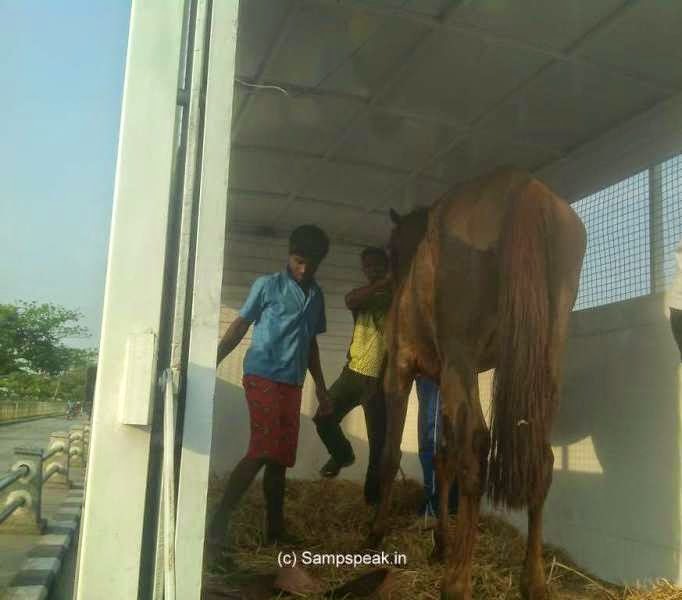 But like most racehorses past their prime, the abandoned 10-yearold horse had endured a mighty fall — broken down and dehydrated, it had collapsed when a Blue Cross of India volunteer found it on Marina Beach. 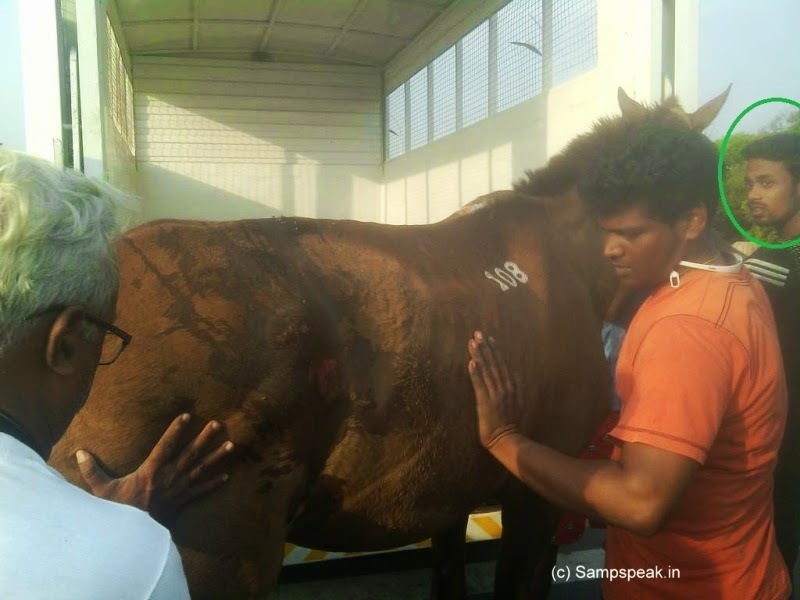 Sathishwaran found the horse sprawled on the road near the Kannagi statue at Marina Beach at 5.30am on Saturday. “The horse had fainted due to exhaustion and a crowd had gathered around it,” the Blue Cross volunteer said. “With the help of some of the bystanders, I placed it on the pedestrian pathway and gave it water. Others tried to feed it grass, but the horse struggled to stand. 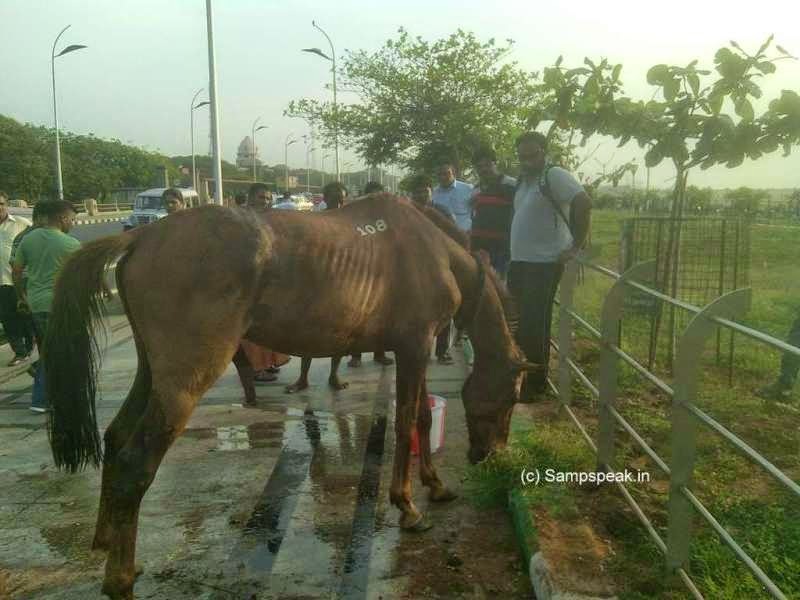 I called Blue Cross officials and they sent an ambulance that took it for treatment.” The horse was branded with a code identifying the farm on which it was raised and trained: ‘CHS4’, the Chettinad Stud & Agricultural Farm, and its stable number. Named ‘General’ by Blue Cross officials, the horse had suffered scrape wounds to most of the left side of the body. The house is recovering in the organisation’s care. Blue Cross India general manager Dawn Williams says despite General’s sorry state, its features clearly reveal that a horse from a premier bloodline. “When a horse is injured too severely to race again or is retired due to age or after a string of losses, its owners have no qualms about abandoning the animal,” he said. PeTA India CEO Poorva Joshipura agrees. Horseracing may be glamorous but there is a “cruel side to the so-called sport”, she says. “Even the big winners often lose when their time is up,” she said, adding that during their careers, the animals are pushed to their limits and beyond, often leading to grievous injuries. “They are made to race when their skeletal system is still growing and the animals are unprepared to handle the pressures of competition,” Joshipura said. “Horses that don’t make the grade may be abandoned and used to haul heavy loads.” Often the injuries that a racehorse sustains cannot be treated. In some cases, the pain that the animal sustains is so intense that veterinarians advise that it be put it down as the most humane option. A horse trainer at a city stud farm said retired horses are either given to riding schools or private farms. “What happens after they leave the stud farm is a grey area,” he admitted. In concluding, away from all this, a couple of years back three top horses-Ocean and Beyond, Star Future and Eloise-belonging to three top trainers at the Mahalaxmi Racecourse tested positive for the prohibited substance 'boldenone'. The substance was detected in the urine samples of the horses taken after their top-three position finish in the first two classic races of the Mumbai Season.